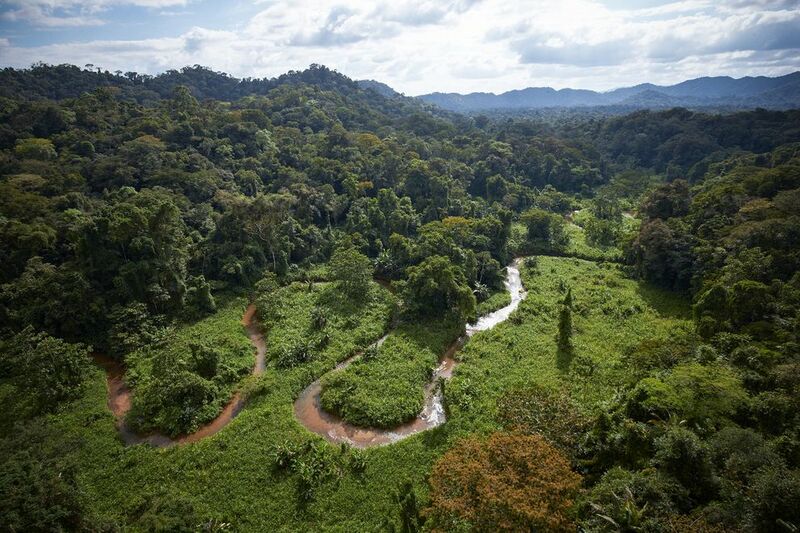 A team of archaeologists returned Wednesday from a site they heavily surveyed – an area of jungle that was once an extensive urban plan – a series of earthworks, mounds, and even an earthen burial pyramid – all remnants of an ancient culture that managed to thrive in the region over a thousand years ago before disappearing. They also uncovered a number of ancient stone sculptures. They were led to the location in the Mosquitia rain forest by Honduran military troops. While people have known for ages that sophisticated civilizations once thrived throughout Central and South America, such as the Mayans and Aztecs, so obscure is this vanished culture that archaeologists have not even given their civilization a name. Christopher Fisher, a archaeologist specializing in Mesoamerican history at Colorado State University was astounded by the pristine conditions of preservation, rare in the rainforest due to high levels of moisture, and also the fact that it was largely unlooted, something he said was “incredibly rare.” Fisher believes that the cache of stone sculptures they found near the bottom of the pyramid was likely an offering to their gods. “a were-jaguar,” a shaman transformed in a spirit state. The artifact might also represent an ancient athlete, playing a type of ball game popular throughout Mesoamerica similar to soccer. “The figure seems to be wearing a helmet,” said Fisher. Oscar Neil Cruz, another team member and the head archaeologist at the Honduran Institute of Anthropology and History, has dated the artifacts between A.D. 1000 to 1400, before the arrival of European conquistadors. Archaeologists have not yet excavated anything and the site’s location remains undisclosed in order to avert potential looting. They discovered the location by stream, one which goes through an unexplored valley deep within Mosquitia of eastern Honduras, where the City of the Monkey God was long said to exist. Doing an aerial survey of the valley, archaeologists first found the site in May 2012, hidden beneath the swamps and rivers of a land that is one of the few unexplored realms on the planet. For centuries, explorers and prospectors who came to Central America had heard stories from the indigenous people of a white city within the jungle, where their ancestors had taken shelter from Spanish conquistadors – a sort of paradise not unlike Avalon or the Garden of Eden. There had been efforts by archaeologists to determine whether the City of the Monkey God ever really existed since the 1920s. Theodore Morde of the Museum of the American Indian (which is currently part of the Smithsonian Institution,) led the most famous of these expeditions back in 1940. Morde even claimed to have discovered the city and brought many artifacts with him back to the United States, although he refused to reveal the location and never fulfilled his promise to return with a fully planned excavation. It was Morde who first referred to it as the City of the Monkey God, based on stories he heard from the natives who claimed a large statue of a simian like god was buried somewhere in the sediments. Monde committed suicide in 1954, and never revisited the site. Filmmakers Steve Elkins and Bill Benenson took up the search in 2012, flying over the region and discovering a crater-shaped valley, surrounded by steep mountains with the help of the Center for Airborne Laser Mapping at the University of Houston. They used a Cessna Skymaster, which explored the canopy with laser light radar technology. Processed images of the flight revealed that much of the terrain along this river had been reshaped for irrigation by human hands. Yet, over the centuries, life has found a way to take over. Many of the tropical primates and birds found there had likely never seen a human. An exploration team of archaeologists from both the United States and Honduras visited the site, joined by a lidar engineer, an anthropologist, an ethnobotanist, some documentary filmmakers, and support personnel. Security was provided by 16 Honduran Special Forces soldiers provided security. A writer and photographer were sent on assignment by the National Geographic Society. While they did in fact confirm the features of a city, archaeologists since Morde have begun to expect that the Mosquitia valley may be concealing a number of lost ports, implying that there is an entire civilization beneath it waiting to be discovered.